The year is 2026. Herbie Hunterâ€™s life has been turned upside down. After his father died, he and his mother had no choice but to go and live with Herbieâ€™s grandmother in Paradise Rift. But Herbie quickly learns that this is no normal townâ€”a UFO worshipping cult known as the Light Seekers have made it their headquarters, and strange happenings have plagued the town since their arrival. On his first night in the rift, Herbie sees mysterious lights floating in the sky followed by a frantic woman running into the desert. But what Herbie meets in the darkness is no normal woman, but a shadowy creature with hands drenched in blood. After barely escaping with his life, Herbie is desperate to uncover whose blood was on the beastâ€™s hands, and what role the Light Seekers played in its creation. 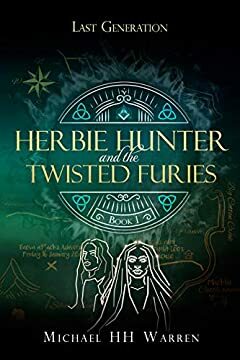 With the help of his friends, family and a secret order of occult scholars, Herbie must reveal the truth despite the odds being stacked against him. Last Generation is a series of YA magical realism action and adventure novels that tells a story of the battle between good and evil that has been waging since the dawn of time.